Looking for more information About Us? Be sure to visit our F.A.Q. page or the Installation Instructions page if you have questions about our products. We also have videos that explain how to install or use our products. If you still do not find the information you are looking for don't hesitate to give us a call at 800-933-3372 or contact us via email. 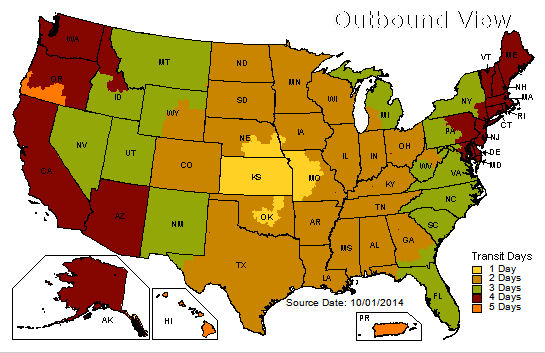 The map image below shows transit times for shipments coming from our Southeast Kansas location using UPS ground. We also ship small items through the USPS using flat rate packages that usually deliver in 1 to 3 business days. We have a 30 day money back return policy. We do not refund the original shipment amount and the buyer is responsible for the return shipment. We do offer refunds after the 30 day period but restocking fees will be applied.